Atlanta has Livable Centers. San Francisco has Priority Development Areas. And here in D.C., we have Activity Centers. Different terms, similar concepts: places or hubs in large metropolitan areas where future growth is designated, encouraged, and concentrated. Activity Centers have big implications regarding efficiencies in transportation, sustainability, and livability, particularly in a post-recession environment of scarce financial resources that need to be allocated with a high degree of purpose and attention to the bottom line. D.C.’s Activity Center initiative is a product of Metropolitan Washington Council of Government’s (COG’s) Region Forward Coalition, and COG has referred to Activity Centers as “one of our region’s key competitive advantages.” Here at Mobility Lab, we believe they are so vital to our region’s future prosperity that we have been an active partner on the project, and have devoted an entire category of stories to Activity Centers on the Mobility Lab site. COG, D.C.’s regional planning agency with 22 member jurisdictions, approved a new map of 141 Activity Centers in 2013, and Mobility Lab was one of several organizations conducting placemaking and walkability assessments of 92 of these Centers based on Urban Imprint’s State of Place index. The first report resulting from this assessment was COG’s Strategic Investment Plan, released in April 2013 (and available for viewing here), which targeted economic development strategies for the Activity Centers. The new Place + Opportunity report, approved this week by the COG Board, is an assessment of the placemaking characteristics of this subset of our region’s Centers, grouping them according to similar characteristics and challenges, and identifying distinct Activity Center types to inform planning and development decision making. At the board meeting, Mary Hynes, vice-chair of the Arlington County Board, presented the Place + Opportunity report. The report (and accompanying videos), created in partnership with RCLCO, Urban Imprint, Reconnecting America, and Mobility Lab, has been a Herculean effort requiring buy-in from COG’s member jurisdictions, and the ability to accommodate places as disparate as urban center-city D.C. and small-town Manassas. Not all of COG’s Activity Centers lie in urban areas such as D.C. and Arlington, but those that do should benefit substantially from the Activity Center plan. These nodes, in many cases well served by transit or with that potential, allow for greater density, transit-oriented development (TOD), infill construction, multi-modal transportation options, a high level of other public improvements increasing quality of life, and numerous other efficiencies. Arlington County is of course a leader in this area, particularly when it comes to TOD and walkability (real-estate expert Christopher Leinberger has called Arlington “the gold standard” in this arena). But not all of the region’s Centers or nodes wish to become Arlington County. Sophie Mintier, COG regional planner, addressed this issue at the event, pointing out the diversity of our region’s Activity Centers and diverse “aspirations” of each. 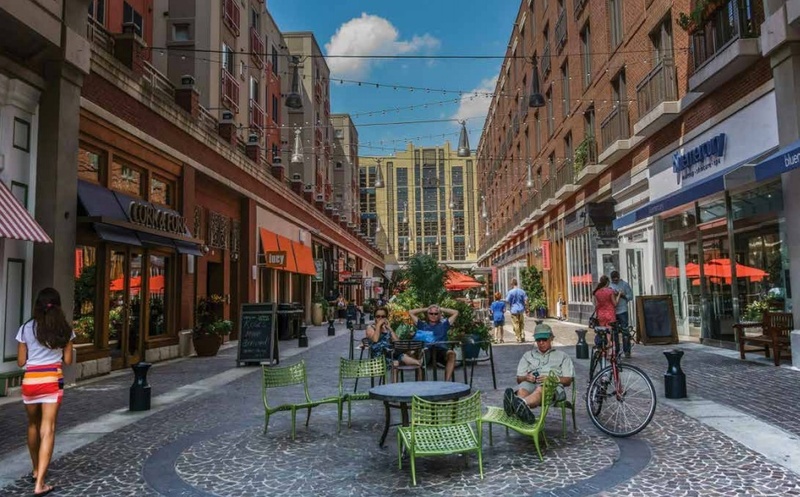 Regardless of the differences between Centers, all have the potential of benefitting from an increased awareness of placemaking and walkability. And as Leinberger has stated, the key to addressing the public’s demand for walkable urban places (“WalkUPs”) lies in creating more of them. Mintier explained how, to accommodate the vast differences between our region’s Activity Centers, COG’s report categorized Centers into one of six “place types,” and enumerated four “opportunity types” (resulting in 24 different and distinct strategies). These strategies range from zoning changes to facilitate TOD, public-private partnerships to finance infrastructure projects, and recommendations to preserve housing affordability. COG’s Place + Opportunity report is an approach at working together across jurisdictional boundaries that one Board member said was akin to the long-term strategies detailed in Bruce Katz’s The Metropolitan Revolution. The report was lauded overall, and passed COG’s Board unanimously. The next phase in the Activity Center project, upon approval and funding by the COG Board, will be assessment of the remaining as-yet-unanalyzed 49 Activity Centers. Meanwhile, it is the hope of Mobility Lab that the Place + Opportunity report (viewable and downloadable here) will inform planning and development decisions to enhance the region in the coming years, particularly in reducing congestion, enhancing livability, and increasing our economic competitiveness. Splash photo by the author. Story photo courtesy the Metropolitan Washington Council of Governments.